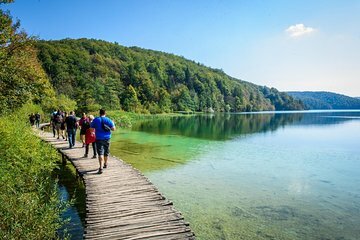 Visitez le parc national des lacs de Plitvice, classé au patrimoine mondial de l'UNESCO, et le village riverain de Rastoke lors de cette excursion d'une journée complète au départ de Zagreb. En minibus climatisé, arrêtez-vous à Rastoke, surnommé le «Petit Plitvice», et admirez ses cascades et ses moulins à eau avant de continuer vers Plitvice. Faites une visite guidée de quatre heures et admirez les lacs et les cascades à pied, en bateau et en tram. Terminez avec le déjeuner (à vos frais) dans un restaurant local avant de retourner à Zagreb. Frais d'entrée inclus. Quittez le centre de Zagreb en minibus climatisé et dirigez-vous vers le sud, en direction de Plitvice. Arrêtez-vous à Turanj pour voir le monument commémoratif de la guerre de la patrie, dédié aux soldats croates tués ici pendant la guerre d'indépendance, entre 1991 et 1995. Ensuite, faites une pause et prenez un café (à vos frais) à Rastoke, un village à l’image parfaite baptisé les «petits lacs de Plitvice». Cette ville historique borde la rivière Slunjčica près de sa jonction avec la rivière Korana, à Plitvice, et est réputée pour ses cascades. Admirez les cascades, les moulins à eau et l'architecture distinctive en pierre et en bois. Continuez ensuite vers le parc national des lacs de Plitvice, classé par l'UNESCO. Composé de 16 lacs reliés par des cascades, le parc est réputé pour sa beauté et ses teintes changeantes, qui passent de la turquoise à l'émeraude et au gris en fonction de leur teneur en minéraux et de l'angle du soleil. Faites une visite guidée en suivant les allées de bois sur les lacs et en profitant de la beauté des cascades. En route, prenez le bateau et le tram pour vous imprégner du paysage. Après quatre heures à Plitvice, dégustez un déjeuner croate classique (à vos frais) dans un restaurant local, avec votre guide vous recommandant des plats et des boissons (à vos frais). Enfin, retournez à Zagreb, où votre visite se termine au point de départ. L'itinéraire peut éventuellement être ajusté en raison de la circulation, des pistes inondées dans le parc ou des mauvaises conditions météorologiques. - Milan, our guide was very knowledgeable and kept our group of 17 moving through the park at a reasonable pace that allowed us to see everything. He shared much with us about the Plitvice Lakes national park, Croatian history, and answered all our questions about both. It was great that he had us go through the park backwards opposite direction from most other tour groups which really helped us avoid some of the crowds and the long line for the boat trip between the upper and lower lakes. - I'm not an outdoorsy person but this is one of the most beautiful places I've ever seen. The different colors are absolutely stunning, as is the landscape surrounding the lakes. - We had good weather - were there in mid-August when it was very warm but it wasn't oppressive or too hot for our hike/walk around the lakes. - The guide picks up your entrance tickets when you arrive at the park so you don't have to wait in the very long line with all the other people who don't have them prearranged. - Very convenient booking, especially where it asks you where you are staying. They emailed me the day before the tour to re-confirm and specify where and what time we would be picked up for our tour. - This is more of a hike than a leisurely walk. Wear close-toed shoes. Ideally sneakers or sturdier. There were a few folks in our group who weren't prepared footwear-wise for 4 hours of walking up, down, and around the park. - This is NOT a tour for small children. I'd recommend 8 years old. There is a lot of walking and you cannot bring a stroller pram on the wooden walkways. - This tour is combined with other groups who are traveling to/from Spit or Zagreb. Some folks on your bus will be transferring to another vehicle after the late lunch stop and continuing on to their destination. This isn't a problem or anything, just FYI. - Bring water - you'll need it. - I wasn't very interested in the Rastoke stop when first reading about it but am glad I saw it. It's really pretty and is a good appetizer to the main course of the park. - When they say it's an all-day tour they mean all day. We were picked up from our hotel at 7:45 am and got back around 8:30 pm. - Listen to your guide! Follow his/her instructions and advice and you'll be sure to have a great time. Shame anyone in your group who isn't listening to the guide. You don't want them to ruin the trip for everyone. - Bring a camera, obviously. I and my family enjoyed this trip, the guide was really good and knowledgeable. He had given us enough time in Plitvice Lakes and Rastoke. We could take nice pictures at different places. It was 5 Hr long trail in National park and he made sure no body is lost. The trail in national park was really good.The tour guide also took us to a nice restaurant where we enjoyed good food.So for others who are looking for travelling option in Croatia for them I suggest you can go for this trip and the tour organizer is really good one and make sure you are supported by travel organizers from Portal day tours. Marinko was a great tour guide and made this a worthwhile tour! He was funny, informative, and helpful--he took photos for us at all the good spots! We were very comfortable on the trip to and from the park and really enjoyed our time. This company provides you with all the information needed for an enjoyable trip, such as recommended shoes, attire, etc. 10/10 I highly recommend this tour! Such a wonderful trip and such a good guide! Marinko was so nice and so helpful, despite the awful weather we encountered it rained non stop and torrential rain! it was so hard to walk in puddles and in very narrow walkways, it was hard to see the beautiful scenery, struggling with our ponchos and umbrellas and trying to squeeze in to walk, there were so many people! 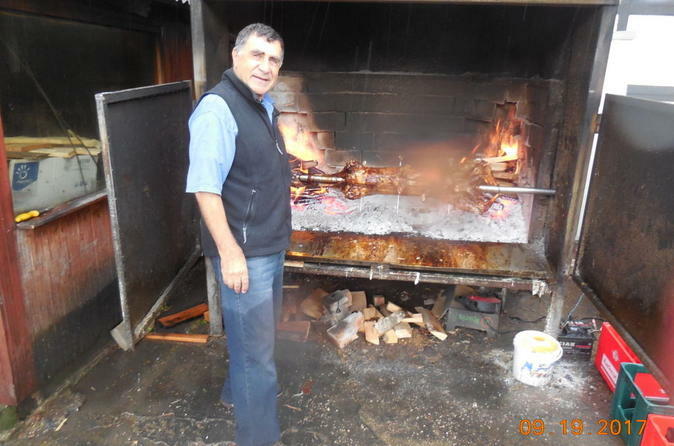 But despite all that, I am glad we did this tour and Marinko took us to a very special restaurant with real local food! I recommend to everyone to take this tour! We were on the tour on 7th Sept 17 . To Begin with I must confess we were extremely distraught with the weather. Thunder storm was predicated. Our tour van and guide picked us up on time. It was raining at the time . However his easy manner and effective communication indicated the weather could be different in the mountains. Marinko gave us hope . Through the journey he kept a steady flow of information that was helpful. He handled the group well , his experience counted . He had a sense of humour that was lively. At the lakes the rain was intermittent. The lakes as such were heavenly and all that is written about . I guess in good weather it would have been much better ! in spite we came back with some great pictures. When it rains a small camera under the umbrella helps. the other important aspect is foot wear based on weather. A good grip sole is essential. Carry some munches there is little time to sit down for a bite . We thank Marinko for a great day . Best to all who visit. its worth it. A very long but great tour that begins in Zagreb early in the morning. Our group was only 8 plus our guide/driver who kept us entertained with stories and facts about the places we were going to. We had a first stop around 35 minutes after leaving the city to get something to eat and also buy a snack for later. Then we visited the village of Rastoke and later we arrived at the lakes. Very nice visit that includes walking/hiking through all 16 lakes in about 4 hours or so. Around 3 PM we left the lakes and went to a restaurant to eat something for lunch. The only issue was the some of the people in the tour were going to Split while another larger group around 50 came from Split to the lakes and some were coming to Zagreb. They arrived later than us to the restaurant and had a pre-arranged meal so us that were returning to Zagreb had to wait 60 minutes doing nothing after we were done eating for them to finish so the tour guides could control who was going were. Ride back to Zagreb took a bit longer because of traffic but aside from that minor detail at the restaurant, a very nice trip. This tour was outstanding! We had a great day with our tour guide, Marinko, who was so knowledge, helpful, and fun! He knew the best places in the park to take our group and we were able to avoid many of the touristy areas. It was really great to hear his stories about Croatia and the local areas near Plitvice Lakes. The trip to and from the Lakes was relaxing and we had a great time at the local restaurant afterwards. Plitvice Lakes are stunning and I would highly recommend this tour!